THE AIM ON THE COURSE IS FOR YOU TO LEARN TO MEDITATE ON YOUR OWN, ANYWHERE, ANYTIME. Wednesday evenings in May 2019. 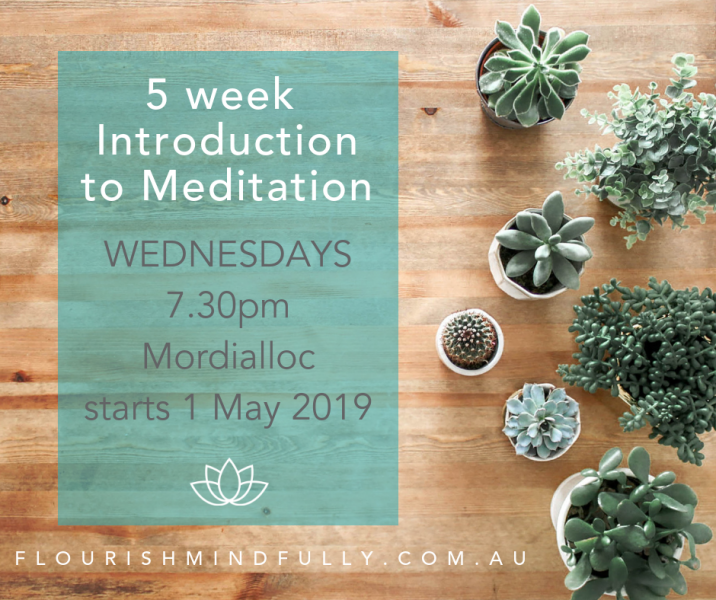 Week 3: What happens when we meditate? Come along to learn practical ways to incorporate meditation and mindfulness into your day. This course provides a common sense approach to meditation techniques you can easily incorporate into a busy life and feel a difference after the very first session. We live in a contemporary world and can't retreat to a cave and sit in lotus pose and still our minds! And you know what, we don't need to stop our thoughts to meditate; and you can meditate in as little as 10 seconds. Come along to learn how and experience the difference - ways to release the pressure valve, destress & recharge and appreciate everyday moments. You'll sleep better, be more productive & less stressed.